MediMiss bedsore diabetic ulcer natural Natural Remedies open wound pressure ulcer Skin Care skin ulcer wound care How Can You Care For a Slow Healing Open Wound? Did you ever have a wound or sore that simply does not heal no matter what you try? Perhaps it's even been treated by a physician, but still remains. 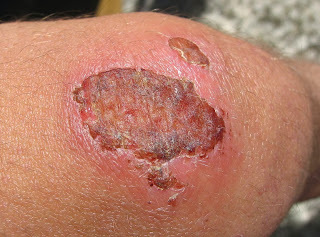 This type of wound is characterized by skin deterioration to the point where the underlying tissue is exposed. Such wounds are also called sores or ulcers and can have a variety of causes. But they all have one thing in common --- prompt treatment is important to prevent infection and further deterioration of the surrounding area. Venous Skin Ulcers develop when veins don't allow blood to flow back to the heart normally. If you have a wound that will not heal in a reasonable period of time, it is always wise to seek medical treatment. But is there something you can do initially to prevent a wound from getting worse and help it heal more quickly? Why can a natural product often heal wounds better than prescription drugs? The answer is simple... By using ingredients that support the natural action of the body's immune system, you can achieve the desired result in a safe, non-invasive manner. For example, some traditional wound care treatments may be quite expensive and have side effects such as higher blood pressure, higher eye pressure (glaucoma), retention of fluid, skin thinning, red lesions and mood swings. An effective natural treatment can help fight infection and heal the wound without side effects and at significantly lower cost. For example, the natural treatment Dr. Glaser recommends contains an enzyme (lysozyme) that is found in the tears, saliva, mucus, urine and salt water body fluids. Lysozyme targets harmful bacteria while sparing beneficial ones. The treatment also contains sea salt with all the trace minerals left intact. The sea salt solution provides an ideal pH environment for the lysozyme to operate, as well as nutrients that support new cell growth. This creates a product that's so safe it can be sprayed directly in the eyes or mouth, yet effectively supports and speeds the body's natural healing process. While you should always consult with your physician for any chronic medical condition, you may find a natural product will encourage your body's own innate healing ability better than conventional preparations. 4 "Post-Op Phenol-Alcohol Procedure", Study In The Use Of Ocean Aid Products In Common Podiatric Conditions, presentation by Paul Glaser, DPM, FACAS Summit Podiatry, North Carolina.